The origin of Toulon High School was made available to us by research conducted by John Ballentine. John's research showed that Toulon High School was established in 1879, a very early establishment for that time period. Toulon High School continued under this name until 1912. At that time Toulon High School became known as Toulon Township High School. This name continued on for 58 years. LaFayette (population 227) is located in the northwestern portion of Stark County. LaFayette sits quietly on Illinois Route 17 about 2 miles west of Illinois Route 78. The town sits about 12 miles south-southwest of Kewanee. The first classes at LaFayette High School were held in 1891 in a building downtown. The high school moved to a location on the southern edge of the town in 1899, where that building still stands today. LaFayette High School served the students of the town for 79 years. Toulon-LaFayette High School: The school districts of Toulon and LaFayette agreed to consolidate their educational resources in the spring of 1970. This arrangement led to the renaming of Toulon High School to Toulon-LaFayette High School. The LaFayette school served as a grade school for the district until 1978 when all classes were moved to Toulon. The Toulon High School building became the Toulon-LaFayette High School building in 1970. Toulon-LaFayette High School continued to serve the two communities for 22 more years. It was in 1992 that the school districts of Toulon-LaFayette and nearby Wyoming agreed to consolidate their resources. This effort resulted in the forming of Stark County High School. Stark County High School is located in the Toulon-LaFayette High School building. A nice website to visit dedicated to Toulon-LaFayette High School can be viewed at http://toulonhighschool.com/ . T-LHS team nickname: the "Trojans"
School Fight Song: "Trojan March"
Come on, and fight to win the game. And all the glory of her name! All Toulon High School stands behind you. Win the game tonight! HEY! For information on the Blackhawk Conference check out John Ballentine's article on the GREAT CONFERENCES page of this site. Toulon-LaFayette High School's football program began in the fall of 1970 and continued through the fall of 1991 for 22 seasons until Stark County High was formed. Students from LaFayette had in football another sport available to them that LaFayette High had not offered for decades. T-L had fourteen winning seasons against 8 losing years. A State football tournament became available for the first time in the fall of 1974. In 1985, T-L tied with the Cambridge Vikings for the Lincoln Trail Conference championship, but lost a coin toss to the Eureka Hornets to enter the State tournament that year. In 1990, the T-L Trojans qualified for the State tournament, but lost 24-16 in the opening round to the Manlius-Tampico Red Warriors. 1973-74 6-4/ 5-4 " " "
1974-75 7-2 " " "
1975-76 7-2 " " "
1978-79 4-5/ 3-4 J. R. Hofman " , "
1980-81 2-7/ 1-6 " "
1982-83 6-3/ 5-2 " " , "
1983-84 3-6/ 3-4 " " , "
1984-85 4-5/ 3-4 " " , "
1985-86 6-3/ 6-1 * " " , "
1987-88 6-3/ 5-2 " " , "
1988-89 5-4/ 3-3 (7 members)" " , "
1989-90 4-5/ 2-5 " " , "
1990-91 7-3/ 5-2 # " " , "
1991-92 2-7/ 1-6 " "
Stark County High School began for 1992-93. 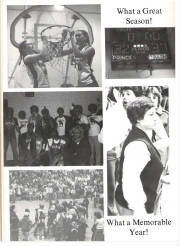 In 1970-71, Toulon-LaFayette High School continued the tradition of hitting the hardwoods every Tuesday and Friday evening from November to March. T-L was a combination of 2 separately good teams from both communities who formed an exceptionally strong team in 1970-71. T-L High brought home the Blackhawk championship trophy for the first time in 10 years with an 11-2 conference record. 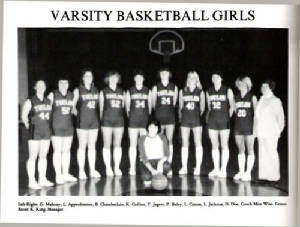 In 1972-73, T-L was co-champion of the Inter County Athletic Conference with Elmsood having both achieved 4-1 records. T-L once more became co-champion of the ICAC with Brimfield both at 4-1 in T-L's final year (1975-76) in the ICAC and the Blackhawk Conference. T-L joined the newly formed Lincoln Trail Conference for the 1976-77 school year and competed as Toulon-LaFayette until 1992 when Stark County High was established for the 1992-93 school year. 1975-76 9-15/2-7/4-1 * " "
1986-87 13-15/7-7 Larry Freeman "
1991-92 7-18/2-12 Al Curry "
Toulon-LaFayette High competed in the 10 team Blackhawk Conference from 1971-76. They won the track & field conference championship in 1971, '73, and '75. T-L joined the newly formed 8 team Lincoln Trail Conference which also included Alexis, Alwood, Cambridge, Galva, Ro(w)va, Wethersfield, and Winola in 1976-77 competing through 1992. T-L's best LTC meet occurred in 1983 with a second place finish. T-L won the Stark County Meet dominating 17 times in 19 years. T-L became part of Stark County High for the 1992-93 school year, which continued competing in the LTC. 1974-75 # * " "
1971, 1972, 1973, 1974, 1975, 1976, 1977, 1978, 1978, 1979, 1980, 1981, 1982, 1983, 1984, 1986, 1987, 1989. If you count the 1970 meet won by Toulon High School, the boys from this school swept the 1970s and won a total of 18 Stark County Boys Track & Field Meet Championships as Toulon-LaFayette High School!! The Lady Trojans earned some IHSA hardware also. More information is need regarding the better seasons enjoyed by the Toulon HS Lady Trojan basketball teams. More information is being sought about the Toluon Volleyball program. They won the Lincoln Trail Conference championship in 1980. In addition, two Relay Teams of the late 1970s earned IHSA medals and the Lady Trojans of 1981 won the Lincoln Trail Conference championship. 1986-87 Team Finished EIGHTH in IHSA Class A State Meet!! 1987-88 Team Finished SIXTH in IHSA Class A State Meet!! 1988-89 Team Finished SEVENTH in IHSA Class A State Meet!! ## Blackhawk Conference membership ended the next school year. ### Baseball was discontinued at Toulon-LaFayette High from 1975-76 to 1991-92 when in the Blackhawk and Lincoln Trail Conferences ; Stark County High School reinstated baseball beginning with the 1993-94 school year. The 1985 Alumni booklet partially covered the years (1943-1986) and left most years 1913-1942/1987-1992 without the names of the class valedictorian and salutatorian. Maiden names for the ladies are not listed because of possible name changes since 1985, and the dedication of time required involved with collecting/obtaining the corrected last names. If you definitely know someones present last name, please contact Mary and Tim Milroy or The Stark County News office at 309-286-4444 or use email -- www.editor@countyenews.com . *Stark County High School began for the 1992-93 school year.